Fashion With A Conscience has moved. Visit www.fashionwithaconscience.org: July faves continued: Michelle and Wu. Once again Jason Wu came out on top. For the month of July, Wu dressed the First lady in 4 dresses. The young designer did so twice abroad and twice in the US. 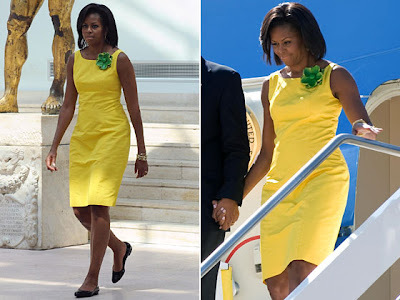 In Moscow, Michelle wore a boat neck dress by Wu in white with a black motif and a matching brooch. In Rome, she sported a surprisingly similar dress, in yellow with, but of course, a green flower brooch for a little extra humph. 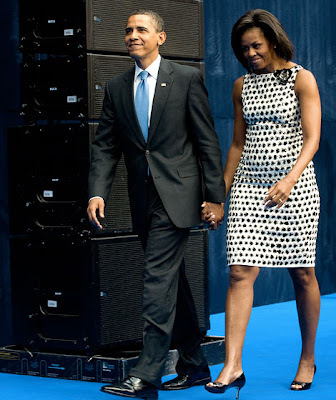 Back in Washington, Michelle opted for a blue number and a belted black, ivory and red cocktail dress. 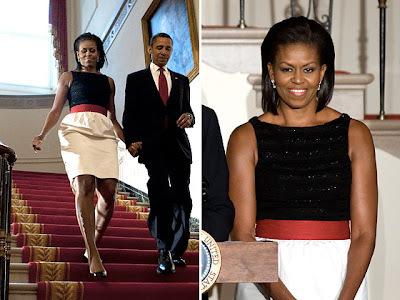 Needless to say that since the Inaugural Ball, Jason Wu has remained hot on the Michelle-o-meter. July 7th: At a graduation ceremony for the National School of Economics at Gostiny Dvor in Moscow in a dress by Jason Wu. Photo: AFP. July 8th: Arriving in Rome in a dress by Jason Wu. Photo: AFP. July 24th: Evening parade at the Washington Marine Barracks in Washington DC. Dress by Jason Wu. Photo: Getty Images. July 27th: Reception for ambassadors to the United States in the Grand Foyer of the White House in Washington DC. Dress by Jason Wu. Photo: Getty Images.